Just one batch of homemade Halloween snacks and sweets can upgrade a party that has nothing else but packaged candy and cool spooky beers. Kitchy Kitchen blogger Claire Thomas specializes in doable entertaining, including easy recipes and DIYs. 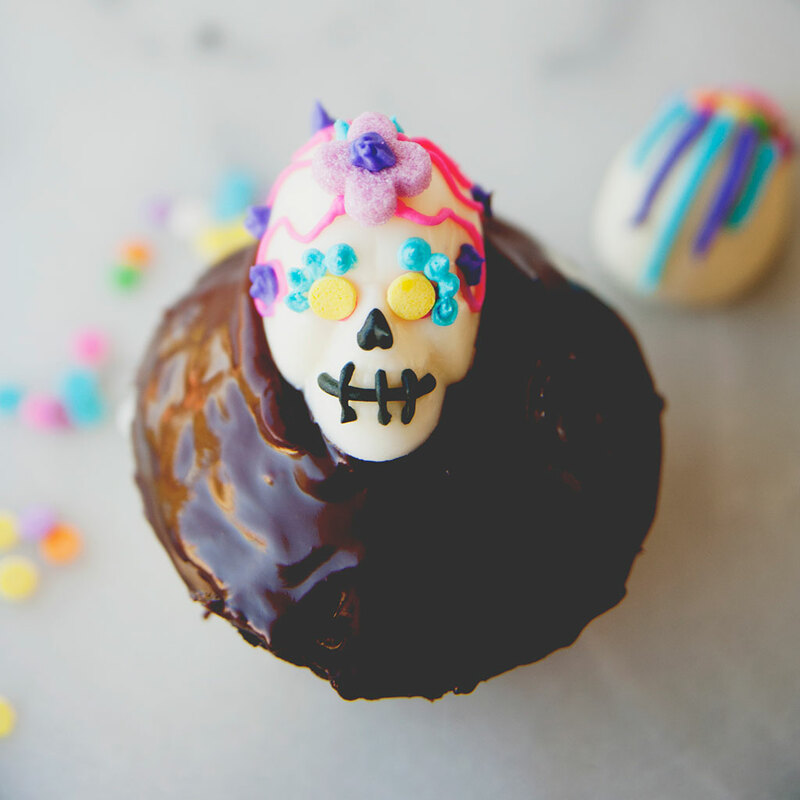 Her new book, The Kitchy Kitchen: New Classics for Living Deliciously, has all sorts of great dishes and tips, but here she shares some of her favorite spooky recipes for Halloween and Dia de Los Muertos, which falls on November 1. Place the candy melts in a glass or plastic bowl and microwave in 30-second increments, until melted. (It took me 90 seconds.) Using your disher, scoop the melted candy into the skull mold. Lightly tap the mold on the counter to remove any air bubbles. Place the mold in the fridge or freezer until the candy has set (about 10 minutes in the freezer, 30 minutes in the fridge). Turn the mold over about an inch above the counter (line with wax paper if you like) and gently flex or tap the mold. The skulls should pop right out. To decorate the skulls, start by drawing a line across the mouth, then adding a few hash marks across. Add two dots for the eyes, and for the nose, draw an upside-down heart. This is done by squeezing a dollop at the bottom and ticking it upward. Don't try to draw a heart—it's too small to have that kind of precision. Once your face is done, get decorating! Add dots and swirls and sprinkles. Let the finished skulls sit for about 5 minutes to set. In a saucepan over medium heat, combine the corn syrup, butter, cold water, confectioners' sugar and marshmallows. Heat and stir until the mixture comes to a boil. Carefully combine the hot mixture with the popcorn, coating each kernel. Grease hands with vegetable shortening and quickly shape the coated popcorn into balls before it cools. Wrap each ball with cellophane or plastic wrap and store at room temperature. In a heavy, medium-sized saucepan, stir together the cream, sugars and salt. Place the saucepan over medium-high heat and bring to a boil, stirring constantly with a wooden spoon. Once the mixture boils, with a heatproof pastry brush that has been dipped in warm water, wash down the sides of the saucepan to remove any sugar crystals that may have formed. Boil the mixture over medium-high heat (do not stir) until the temperature reaches 245°. Remove from heat and stir in the vanilla extract. Grease a sheet pan and pour the caramel into your greased pan and let cool to room temperature, then pop in the fridge for at least 2 hours, or when it's completely chilled. When chilled, scoop out tablespoon-sized balls of the caramel with a greased spoon. If you want, roll the caramels in an add-on. Wrap in wax paper. And what would fall be without a step-by-step guide to making fast and delicious candy apples?